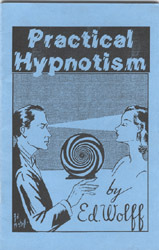 Discount Magic - Practical Hypnotism Book. This complete mini-course in hypnotism starts with the assumption that the reader knows nothing about the subject at all and then rapidly leads him, step by step, to the point where he can hypnotize perfect strangers. Learn how to perform basics tests like tying a subject's hands together, making them fall backward, etc. Diagrams and concise prose make it all clear. This product was added to our catalog on Tuesday 24 August, 2004.